The Global Diagnostics Partnering 2010-2018 report provides comprehensive understanding and unprecedented access to the diagnostic partnering agreements entered into by the worlds leading companies. The report provides a detailed understanding and analysis of how and why companies enter Diagnostics partnering deals. These deals tend to be multicomponent, starting with collaborative R&D, and proceed to commercialization of outcomes. This report provides details of the latest Diagnostics agreements announced in the life sciences since 2010. The report takes the reader through a comprehensive review Diagnostics deal trends, key players, top deal values, as well as deal financials, allowing the understanding of how, why and under what terms, companies are entering Diagnostics partnering deals. The report presents financial deal term values for Diagnostics deals, listing by headline value, upfront payments, milestone payments and royalties, enabling readers to analyse and benchmark the financial value of deals. The middle section of the report explores the leading dealmakers in the Diagnostics partnering field; both the leading deal values and most active Diagnostics dealmaker companies are reported allowing the reader to see who is succeeding in this dynamic dealmaking market. One of the key highlights of the report is that over 3,600 online deal records of actual Diagnostics deals, as disclosed by the deal parties, are included towards the end of the report in a directory format – by company A-Z, stage of development, deal type, therapy focus, and technology type – that is easy to reference. Each deal record in the report links via Weblink to an online version of the deal. The initial chapters of this report provide an orientation of Diagnostics dealmaking. Chapter 1 provides an introduction to the report, whilst chapter 2 provides an overview of the trends in Diagnostics dealmaking since 2010, including details of headline, upfront, milestone and royalty terms. Chapter 3 provides a review of the leading Diagnostics deals since 2010. Deals are listed by headline value. Where the deal has an agreement contract published at the SEC a link provides online access to the contract. Chapter 4 provides a comprehensive listing of the top 25 most active companies in Diagnostics dealmaking with a brief summary followed by a comprehensive listing of Diagnostics deals announded by that company, as well as contract documents, where available. Chapter 5 provides a comprehensive and detailed review of Diagnostics partnering deals signed and announced since Jan 2010, where a contract document is available in the public domain. Each deal title links via Weblink to an online version of the deal record and contract document, providing easy access to each contract document on demand. Chapter 6 provides a comprehensive and detailed review of Diagnostics partnering deals signed and announced since Jan 2010. The chapter is organized by specific Diagnostics technology type. Each deal title links via Weblink to an online version of the deal record and where available, the contract document, providing easy access to each deal on demand. A comprehensive series of appendices is provided organized by Diagnostics partnering company A-Z, stage of development, deal type, and therapy focus. Each deal title links via Weblink to an online version of the deal record and where available, the contract document, providing easy access to each deal on demand. The report also includes numerous tables and figures that illustrate the trends and activities in Diagnostics partnering and dealmaking since 2010. In conclusion, this report provides everything a prospective dealmaker needs to know about partnering in the research, development and commercialization of Diagnostics technologies and products. Global Diagnostics Partnering 2010-2018: Deal trends, players, financials and forecasts is intended to provide the reader with an in-depth understanding and access to Diagnostics trends and structure of deals entered into by leading companies worldwide. 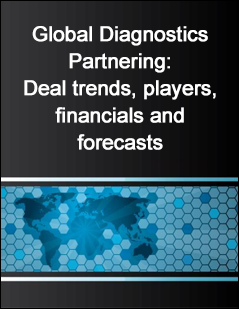 The Global Diagnostics Partnering 2010-2018: Deal trends, players, financials and forecasts report provides comprehensive access to available deals and contract documents for over 3,600 Diagnostics deals.